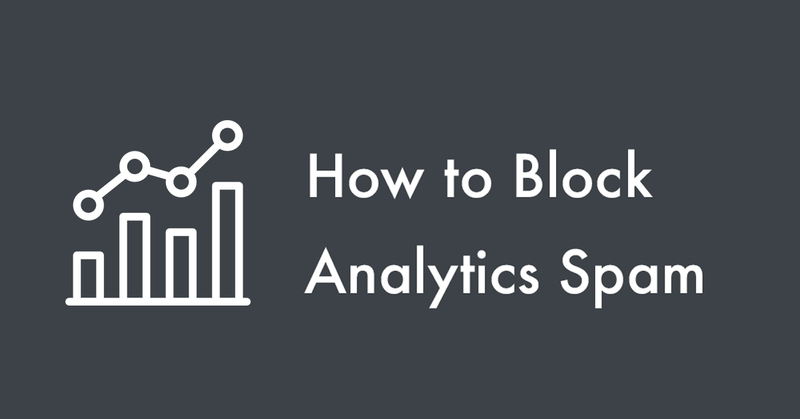 This blog post is a master guide to block Google Analytics referrer spam. I’ve added various methods to block the referral spam and I’ll update the content accordingly. You’re here because of the new referral traffic from 500-good-starts.xyz, 2-easy.xyz, secret-promotion.com, get-here-web.com, yesgood-now.com, yes-do-now.com, advert-seo.com, advertising-seo.com, ads-seoservices.com, seo-services-ads.com, ads-services-seo.com, ads-seo-manager.com, ai-seo-service.com, fast-seo-links.com, autoseotips.com, wakeupseoconsultant.com, 1-best-seo.com, 9-reasons-for-seo.com, 16-reasons-for-seo.com, local-seo-for-multiple-locations.com, seo-b2b.com, affordable-link-building.com, free-seo-consultation.com, get-seo-help.com, your-seo-promotion.com or its variants are spamming your Google Analytics data. 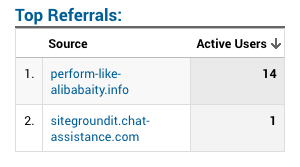 Here’s how to block that single referral domain and related multiple referrers. 12/19/1018: Added 1-best-seo.com fix and NGINX method to block the Analytics spam. 10/10/2018: Added the solution to fix better-seo-promotion.com spam. 09/27/2018 11:57 PM: Blimey! It seems like they’re targeting me for writing this blog post. 09/27/2018 11:16 PM: Added the Cloudflare method to block servers that spam your website. 09/25/2018: This guide has the solution to fix your-seo-promotion-service.com-spam, my-seo-promotion-service.com, and other domains that spam Google Analytics. Just change the domain name/URL accordingly. I’ve added a new .htaccess method also (future-proof). Click Admin, and navigate to the view in which you want to create the filter. Enter a name for the filter. Let’s name it 500-good-starts.xyz. Set the Filter Type to Custom. Now Set the Filter field to Campaign Source. Enter the Filter Pattern. In this case, add 500-good-starts.xyz (the-spam-domain-name.tld) and click Save. You can use the regular expression in the Filter Pattern field to exclude several referring sources. i.e., If you want to add multiple URLs, make a filter pattern separated by a | (pipeline). Visit this link to learn more about setting filters on different levels. 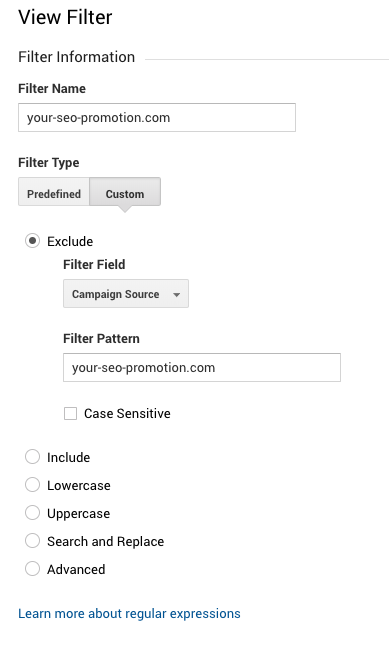 You may also set the Language Settings Filter and Campaign Referral Path Filter as well. Applying filters is more like a band-aid solution. The spam sites are still sending traffic to your website, and GA doesn’t show it. Want to block the referral sites before they get to your site? There are two methods to block referral spam using .htaccess. You have to be careful when editing .htaccess files, as a small mistake can make your website stop working or throw a server error loop. So have a backup! Copy and paste the old content of .htaccess file somewhere safe before proceeding. Usually, the .htaccess file goes to the root of your website (/public_html for example, the same location of wp-config.php). If there is none, you can create a new file. But watch out not to create something like “.htaccess.txt” if you do it with notepad (which usually appends .txt to all files). Note: Check whether a RewriteEngine On line is already inside your .htaccess file. Then you don’t need to copy that particular line from the code I shared. RewriteEngine only needs to occur once in the file, preferably at the top. There are chances the spammer may spin up more domain names for this unholy practice. Solution? Deny their server to access your website. Proceed at your own risk. As you can see, 217.23.10.44 turns out to the unique IP of the domain. Facebook, Inc. CDN uses specific IP ranges for delivering Facebook.com. Here’s a list of IP Ranges that Cloudflare use. Make sure that you identify the unique IP of spammer and not IP ranges of a CDN service. Make sure that you enter the correct IP address. Doing so will block all the spammy domains pointed to this server IP address. Proceed at your own risk. Contact your host to confirm the location of nginx.conf file. Make sure you have root access to the host. Always have a backup! Copy and paste the old content of nginx.conf file somewhere safe before proceeding. Nginx’s map (ref) module lets you create variables in Nginx’s configuration file whose values are conditional — that is, they depend on other variables’ values. The map command can only be used inside of the http block. The “~*” means case-insensitive matching. 444 Explained: Connection Closed Without Response is a non-standard status code used to instruct nginx to close the connection without sending a response to the client, most commonly used to deny malicious or malformed requests. This status code is not seen by the client, it only appears in nginx log files. Go to the Firewall app. Add an entry to the Access Rules and select the action. Help someone else by sharing this article. Thank you. Need help optimizing your website analytics, speed and search performance? Connect with me now. nice one thanks – you published an article today for exact thing I was searching for – remove the your-seo-promotion.com from showing up and effecting my analytics. Just started this morning. You’re welcome, Phil. Came across this error last night and fixed it right away. I thought a lot of people would be looking for a solution online- so updated here. Hola: muy buen artículo, corto y preciso, me ha sido de gran utilidad. Era la primera vez que tenía tráfico de referencia de your-seo-promotion.com, no sabía que hacer y estaba preocupado. Gracias por la solución. Me alegra que lo haya encontrado útil. It’s the Ukrainian SEO company Semalt that is behind it and when you contact them, they want to sell you their service. and send you in the dark about your-seo-promotion.com and some other referral url they have. Hey Johan, thank you for sharing this info 🙂 Quite a shady and cold practice to sell someone’s service. For a long time I did not understand where these visitors come from, and how to handle with. Did you know this was going to happen? Thanks a million for this great article. It came just in time. I will check my analytics tomorrow to see if it disappears. This happened to me as well, that’s why I decided to post the solution online after fixing mine. Will GA stop counting these visits immediately or you need to wait e.g. 24 hours before it takes effect? I’m asking because I did today what I read here and I noticed that GA is still counting these spam visits. So maybe it will start blocking them in a few hours not immediately? GA Filters are usually reflected in the real-time reports, but not always, especially if you added the filter within the past hour or two. And it takes time (as much as 24 hours) before filter effects become visible in your data. I’ve updated the post and added the .htaccess method to block spammer’s IP directly. Doing so will make sure your website doesn’t welcome any “hits” from their server. I’ve updated the article, and you can use another .htaccess method as well. Thanks for the tip, I see it from today! I am having this same issue, but my analytics are blocking me from being admin…I know it isn’t the same issue, but I want to block these guys and now can’t do it. Any thoughts on how to get myself back into GA as admin?? UGH! By the way, do you remember who has access to the master account? Did you hire anyone in the past to set up GA? The best method is to get in touch with the admin and sort it out. Or you can speak with Google and fix this issue. You will need two things before you talk to Google. You will need your AdWords Customer ID and your UA number from the Google Analytics. Please refer to this article for detailed info on this. 2 days now I’m trying to block the my-seo-promotion.com unsuccessfully. I have read all the comments, I have block several IPs but nothing. Very thks for you post, it has been very useful to me! and finally I’ve blocked that traffic ! Unfortunately, the .htaccess method did not work for me. It just created a server error and brought all my sites down. 🙁 Several hours of downtime before I realized it. Live and learn. Sorry to hear that TJ. Yes, messing with the .htaccess = playing with fire. Try adding these lines next time (edit the domain name accordingly). Bravo! Alan. I’m glad you found it useful. does this actually harm my ranking or simply manipulate my graphs in ga? It won’t harm your ranking. Thank you for your valuable information. I had the same problem and I was looking for a solution. Thank you so much. Thank you 🙂 I’m a little less savvy with all the IT stuff, I was worried I had ‘broken’ links on my site.